For fans of midcentury design, owning an Eichler house is the holy grail. Built by developer Joseph Eichler, the homes have become icons of California modernism. But even architectural treasures can use an update. 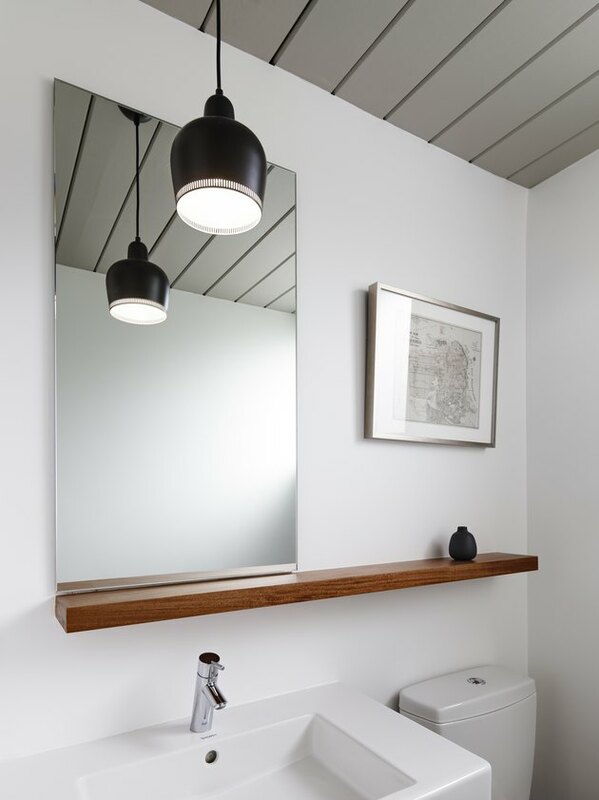 When a young family with two children found an Eichler house in San Francisco's Diamond Heights neighborhood, they knew it needed a refresh to bring out its full potential — and to get rid of dated carpeting, metallic wallpaper, and a cramped kitchen. Bay-area firm Michael Hennessey Architecture was brought on for the overhaul, which included a new floor plan, sliding glass panels, and re-built decks. The house had undergone a hodgepodge of renovations over the years, so Hennessy focused on stripping the home back to the original structure. "We decided to strike a balance between the positive, inherent qualities of an Eichler structure with modern improvements that enhance rather than compete with the existing building," said Hennessy. The finished project feels open and modern, while still celebrating the original design. For Hennessy, this was the goal all along: "We struck a balance between new and old in a meaningful way." A custom mahogany-veneer bench was built in the entry, which leads into the living area. The floors were paved with a light grey porcelain tile. Hennessy emphasized the home's post-and-beam structure in the renovation and painted the original tongue-and-groove a light gray to provide contrast and make the space feel loftier. 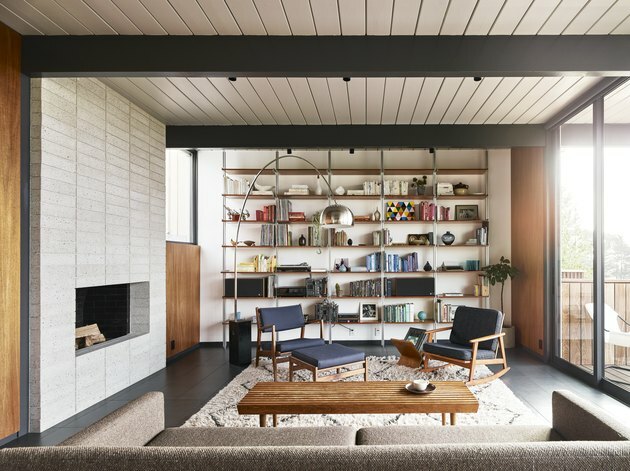 The owners' collection of midcentury furniture is illuminated by an Arco floor lamp and the far wall is lined with a Vitsoe shelving unit. The living room fireplace received a dramatic makeover during the renovation. Hennessy removed the '80s-style stone veneer that was covering it and replaced it with simple concrete black. 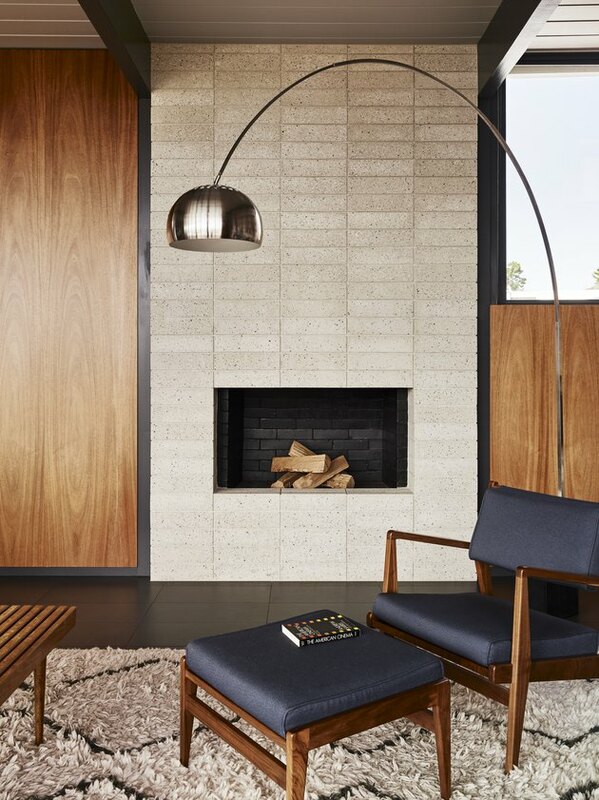 Mahogany veneer paneling was installed to add warmth to the living room and gives a nod to midcentury style. A trio of Alvar Aalto's Hand Grenade pendant lights from Artek hangs above the custom dining table, which expands to seat a crowd. The removal of a screened porch established the homes expansive views and new floor-to-ceiling sliding glass doors let light and air into the space. The kitchen was opened up to connect with the dining and living areas. The custom cabinetry blends warm wood with crisp white paneling for a contemporary take on midcentury aesthetics. The home's bedrooms and bathrooms are located on the lower level. A wall of the master bedroom is lined with mahogany veneer cabinetry outfitted with minimalist door pulls. In the master bathroom, a Novo lighted mirror hangs over the Blu Bathworks under-mount sink, which is outfitted with a faucet by Hansgrohe. A simple, unframed mirror and a Heath Ceramics vase sit atop a mahogany shelf in the powder room. The Vero sink by Duravit has the same Hansgrohe faucet as the master bathroom.